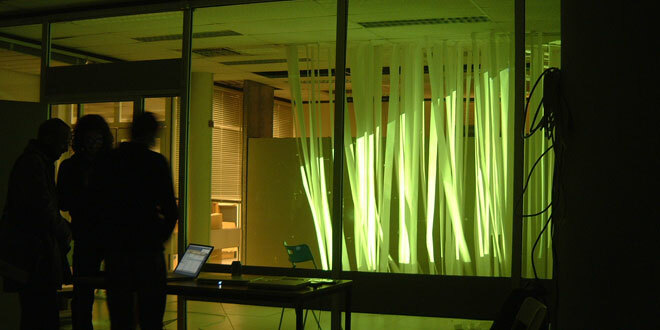 In framework of “Crystalpunk workshop for soft architecture” Megla produced Softscreen. A permeable flexible projection surface made out of paper, animated by airflow corresponding to the movement in the Crystalpunk room. An illuminated walk through volume, striped projection in the motion of underwater sea grass. In collaboration with Auke Touwslager, Informationlab.org. Projection by Wilfried Hou Je Bek, Socialfiction.org.